Chicago's comedy community mourns an integral longtime member of the iO Theater. 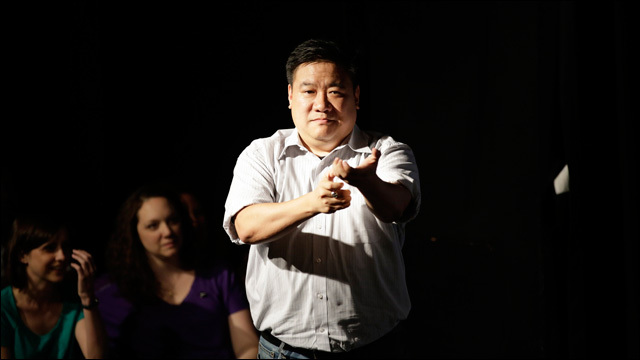 Sad news out of Chicago, where the comedy community is mourning veteran improv performer, director and instructor Jason R. Chin, a longtime member of the iO Theater, who passed away last week. He was 46. Chin was io Chicago's Associate Artistic Director and previously served as head of the comedy theater's training center. He coached, managed and helped create a number of shows, including the long-running "Whirled News Tonight," which uses current events as a springboard for improvisation. He was scheduled to teach a class at iO on Thursday night, but didn't show up, which was unusual. Friends went to Chin's apartment to check on him, and when he didn't answer, they called police. According to the Cook County medical examiner's report, the cause of death was heart disease. Chin was born in New York City in 1968. After watching a friend perform at the famed Second City, he was inspired to move Chicago to pursue improv comedy in 1995. Taking classes at the Improv Olympic, he worked his way up the ranks and became a regular performer and teacher. Rest in peace, Jason R. Chin.